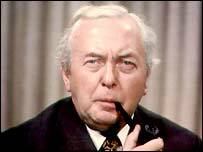 Harold Wilson wanted nuclear submarines to power Belfast during the 1974 Ulster Workers' Council strike. Cabinet documents at the National Archives in Kew reveal the prime minister suggested the plan as the strike took hold. 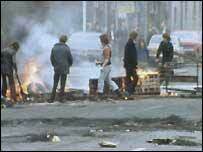 The strike, organised by a coalition of loyalist groups, effectively rendered Northern Ireland ungovernable. Officials scrapped the plan because submarines had neither the energy nor the right cable to connect to Belfast. The strike began on 15 May 1974 as loyalist groups, supported by some unionist politicians, opposed their own community's involvement in a power-sharing deal with nationalists. Loyalist paramilitaries became involved and blockaded key installations in the hope of bringing Northern Ireland to a standstill. Power dropped to a bare minimum, petrol stations ran out of fuel and bakeries were blockaded. Thousands more troops were sent into Northern Ireland to keep supplies moving - but as fast as they opened one route, another was closed. Within four days the situation was so bad Northern Ireland Secretary Merlyn Rees declared a state of emergency and some areas saw panic buying. Ulster Unionist leader Brian Faulkner, who supported the power-sharing deal, told Harold Wilson the executive, which included nationalist politicians, might not survive if he did not act. Chairing emergency Cabinet sessions in London, Harold Wilson asked for radical solutions to break the blockades. In one session, he asked the defence secretary to report on whether they could use nuclear submarines to power Belfast. Officials at the Ministry of Defence looked into the idea and worked out they could have a large submarine, without its nuclear missiles, ready to leave for Belfast within 48 hours. But calculations made by energy experts revealed it would be a futile, if symbolic, gesture. While a vessel with the capacity of a Type 82 destroyer such as HMS Bristol could theoretically provide six megawatts of power, it would leave the authorities needing to find a further 354 megawatts from elsewhere. Nuclear submarines would prove doubly useless: nobody knew how to plug them into the electricity supply in Northern Ireland: there just was not a cable available which would do the job. In theory they could be plugged into the National Grid at one of the royal dockyards in England or Scotland - but that was of no help to Northern Ireland. The idea was shelved and the strike took its hold, leading to the collapse of the Sunningdale Agreement.